After the country mourned over the lives lost in the Charleston SC shooting in 2015 and again with the Texas shooting in November 2017, the laws and politics surrounding guns in churches and gun free zones were cast once again into the spotlight. 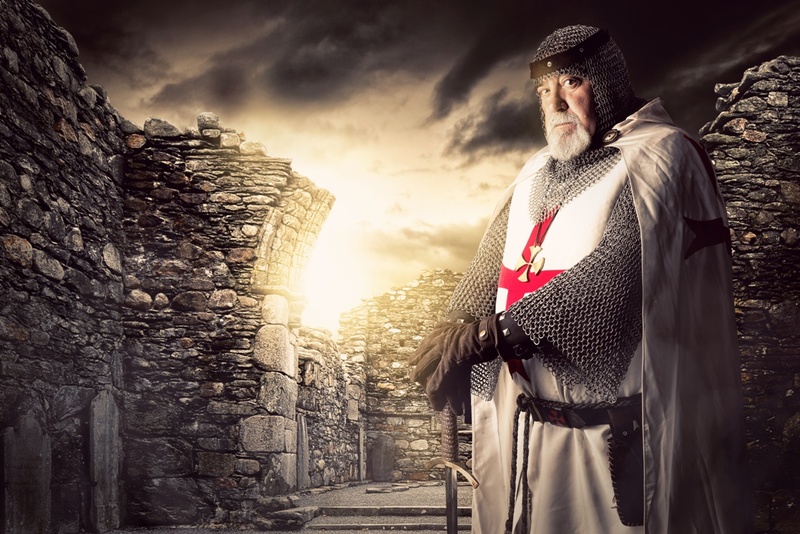 Are Churches As Dangerous as the Media Suggests? In a 2016 Active Shooter training I attended, put on by the Department of Homeland Security, they shared that almost 4% of active shooter situations in the US take place in churches and houses of worship. An active shooter situation is more than something beyond a simple violent attack or shooting. 4% may not seem like a lot… and I was curious so I had our research team do a little digging. I asked our team to find every church shooting from the years 2005 to 2015 in the United States and provide me with a link to the news story. They were able to find 87. As seen below in the map, most states treat churches and houses of worship like any other private property, allowing that unless prohibited by the property owner, those with concealed carry permits or the legal authority to carry concealed may do so in a house of worship. If you live in a state where churches are not off limits, and assuming your church doesn't outwardly prohibit it, should you ask permission? No, you shouldn't ask, but it may be a good idea to ask if there is a security team in place or volunteer to start one. You should never feel obligated to ask permission to carry your firearm anywhere you have a legal right to have it. With that said, it is common for churches to form a security team of volunteers who are positioned, organized, and often trained to response in an emergency. Your contribution to your own security and that of others will be far greater if you are a part of that organized response. Is There An Organized Response Team and Plan? As mentioned above; I can not overemphasize the importance of finding out if your church has an organized security team or response plan. Acting as a lone wolf when there are organized responders will not only make it more difficult to be effective but could inhibit those who are most prepared from doing their job. Ask your church leader if they are aware of any team or organization that is in place. If not would they be open to you organizing some volunteers? Beyond that conversation, if you still decide to proceed against the wishes of your leader that is up to you but at least you have clarified if there is already a plan in place and how you can best participate. If you intend to take action position yourself as close to an entrance as you can. This will empower you to be a first line of defense while also putting you in the best place to observe the entrance and behavior of each attendee. If you are going to experience a threat during your church worship it will most likely come from an outsider and not from a regular attendee. Work hard to recognize faces so you are able to pick out strangers and new attendees. When someone new does attend take the opportunity to introduce yourself, welcome them, and observe their behavior. This is not only tactical its only very Christian. Trust your gut. If someone's behavior seems off or alarming consider sitting close to them, perhaps directly behind them so you can more closely watch their movements while also offering friendship. Churches are really bad places to shoot a firearm. Innocent people are everywhere and a firearm should be thought of as a last resort after any other potential response has been used or eliminated. 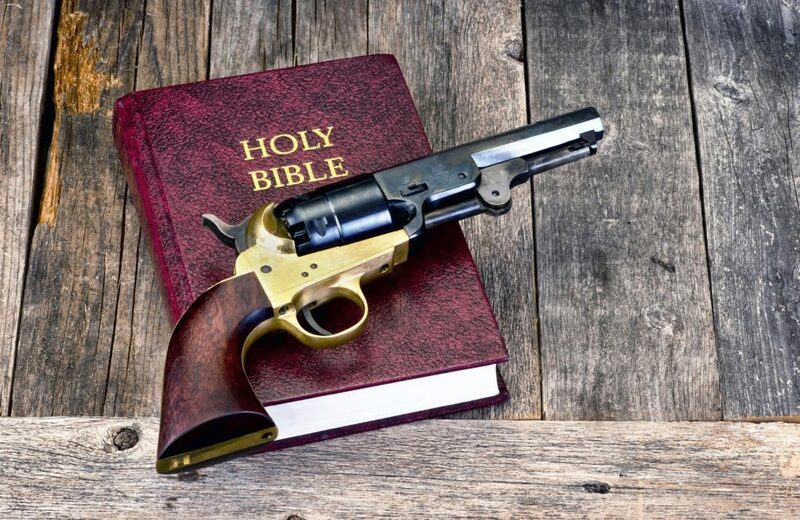 To clarify; I'm not suggesting that if you have an active shooter you first try throwing bibles before you decide to shoot. Act decisively to save lives but leave that firearm holstered until it is abundantly clear that more lives will be lost if you don't act. You need to ask yourself what you are doing to protect your flock. The people who come to your church to worship expect a safe and spiritual environment. Ensuring their security is part of the greater effort you must have to create that environment. Communicate to your regular attendees what you have done to help them feel safe and communicate what policy if any you have in place for those who are not part of that security team. Are you ready to take action? Get your permit (online course here or take an in-person class here) and get involved with your church's security team today! Mr Adams, if you are referring to one of the states shown in Red on our map then the Pastor and the gun owner are both probably in violation of the law. Not saying I’m for or against that action, only that the law makes it clear you can’t carry concealed in a church. If you are referring to one of the yellow states on our map then the Pastor’s permission is all that is required to remove the legal restriction. Louisiana is the only state in red, and the only state where there would be a problem. Gretna exit in Omaha-they mean business and no, I don’t work for them! The map on the page I’m looking at has no red states?? You are correct, currently there are no states in the country that outright prohibit carrying of concealed firearms in places of worship. In Louisiana if you have a conceal carry permit you can attend an additional 8 hour class and be certified to carry in church with church approval. Hope this helps. What red states are you referring to? On the map there are only blue and yellow states and no red. Jason at the time this article was written there were red states on that map. We keep the map updated so there are currently no red states. But don’t forget there has to be a list of those allowed to carry. There are both legal and insurance reason for that. Remember this is still the only country that gives more rights to the criminal than the innocent. Wes, is there a legal doc for Ohio that states there must be a written list of CCW permissions? As of Jan 1 2016 Churches are no longer gun free zones in Texas unless they post the appropriate signage. Thanks Charles, somehow I missed that churches were part of the new legislation down there. Map above has been updated. Texas allows carry in churches unless they post a 30.06 or 30.07 sign. when the concealed law was initially passed it did prohibit carry in churches but it has been amended. Please check to see if you can change the color for Texas. Give any insight on California ? Richard something specific you are looking for? As you can see from the above map California doesn’t have any laws specifically regulating churches and concealed carry. So anyway, we had 5 cameras installed last fall, and some locks improved. I am the first responder to any incident. I’ve been a certified EMT since before y2k. My attitude is “it’s only a matter of time…..
Dr Bill, thanks for your comment. This is a topic our company has been researching recently. It seems like there aren’t a lot of options out there for training oriented for a church security team or team member. We have found in a few metros where there are regularly held training class or courses and there are a few companies that specialize in this kind of training but it is often expensive or very inconvenient for your average church volunteer. We have been looking at developing a course (though probably still a year or more down the road) that would be available digitally and afford-ably. Until then I would focus on small but regular training sessions that are short and incident specific with your team. Maybe its always the first Tuesday night of the month or something similar. One month you might be focused solely on fire evacuations or on identifying suspicious behavior. If you keep these training sessions to no more than 90 minutes or so I think you could expect good attendance. You could probably find instructors or off duty officers (potentially several of the people on your team already) to offer to take turns conducting this training. For groups like yours where there is already a lot of expertise on the team you probably need to focus on getting everyone on the same page. Having standard policies and procedures that everyone knows about to ensure the team moves in sync and in accordance with the guidelines that will minimize risk but also organizational liability. Shalom, also Security for a Messianic Jewish Congregation, congregants are widely scattered in Metro Atlanta, so week night training is out. BIGGEST single issue is getting the congregants to be Aware and that they think of themselves as the “first responder” as they are and the for leadership to be very proactive – what gets done is what the boss checks. Training door/parking lot greeters, on a one by one basis, speaker in lobby so they can at least hear most of the service, and should have camera within a few weeks. we’ve had radios operational for 3-4 months now – one in nursery, greeter and 3rd monitored in the sanctuary. And when it was set up 6-7 years ago, nursery is closest to main entrance, then the sanctuary so it’s a test book case of how not to do it. Additionally I’ve installed fire extinguishers to use as non-lethal weapons in lobby, hallway , nursery and 2 in the sanctuary. In Florida, I would like clarity the laws for renting private school for Sunday worship. We have 1 hired security person each sunday. He has informed us it is a felony for the attendeese to conceal carry and would call the law of he found out any of the church attendees were carrying. Since we are renting the property, would the laws not consider the property to be a church for the hours we are authorized to occupy the premises. I will refrain from my opinion on this one. I would retain a local competent attorney. I live in NJ. With that being said i do not(and never will get due to laws) have a concealed carry license. My pastor has asked me to carry at every event on the church property. Is this legally allowed? Would it be a legal nightmare if something ever happened that i needed to use it? Joe, yes I would say that carrying at the church events had better be worth it because the law in NJ doesn’t give you any specific right to carry concealed or openly anywhere without a license to do so. Even on the church’s property with the property owners permission? If NJ churches are truly considered “any other private property” then the (business) owners should be permitted to carry a firearm without licensing. Question is, who are the “owners” of a church that is incorporated? The trustees? The church officers? This is the kind of thing that is generally state specific and best to consult an attorney about but generally speaking authority is passed from the owner of a property to the legal agent. If the property is leased for example then the person on the lease is the acting agent of the property owner. If the acting agent allows then any representative of the church could also be an acting agent. GET THE PASTOR’S RESPONSE IN WRITING. IF HE DEEMS IT NECESSARY FOR AN ARMED GUARD, YOU WILL BE SOMEWHAT COVERED BY THE PASTOR’S REQUEST. I TOO AM A PART OF CHURCH SECURITY, THEY TOLD ME NOT TO CARRY AS WE HAVE A LARGE CONTINGENT OF LEO’S PRESENT AT ANY ONE SERVICE. WE HAVE FIVE. I TAKE PART IN TWO. COUNT YOUR BLESSINGS AS BEING BLESSED WHEN YOU SERVE THE LORD. You must receive permission in Ohio. Section18.2-283: To a place of worship while a meeting for religious purposes is being held at such place, without good and sufficient reason. Chris, thanks for sharing this. From how I read the statute it sounds like you need a good reason, not permission. Are there court precedents or legal decisions about how good and sufficient reason has been interpreted? The Attorney General of Virginia shared his opinion that fear for personal safety or fear of terrorism we’re “good and sufficient” reasons. As far as I know, no court has established precedence in VA. So much for separation of church and state…. Gene, read the Constitution. There is nothing about “Separation of Church and State”. What it does imply is that the government will not interfere with religion. Please read it before you continue to use that quote. IT HAS ALWAYS SEEM TO ME THAT THE DECISION TO ALWAYS GO ARMED (AS WELL THE ATTENDANT ALERTNESS NECESSITY OF BEING INTENTIONALLY CONSCIOUS OF YOUR SURROUNDINGS AND THUS THE POTENTIAL FOR DANGER) IS SIMPLY AND ALWAYS THE INDIVIDUAL’S RESPONSIBILITY; THAT IS THE RESPONSIBILITY OF EACH OF US TO OUR INDIVIDUAL FAMILY MEMBERS AS WELL AS OUR LOVED ONES AND TO OURSELVES and laws that in any way place in jeopardy our ability to accept and execute that which is our individual responsibility are, as always, a CLEAR AND PRESENT DANGER . . . ALWAYS. Based on that firm belief, for 60 of my soon to be 79 years, while working in 8 states for a 35 year tenure with my employer, beginning with the first two years in Chicago, known as the CRIME CAPITAL OF MIDDLE AMERICA, and subsequently in each of those states where ‘going armed’ was prohibited by each state’s ANTI-GUN LAWS, I have always ‘GONE ARMED REGARDLESS’ and will continue to do so REGARDLESS OF WHETHER OR NOT MY STATE’S HANDGUN PERMIT REMAINS VALID OR NOT!!! AMEN ! I would rather be judged by 12 than be carried by 6 ! REGARDING CHURCH PASTORS AND IT MEMBERS BEING ARMED, THE FOLLOWING IS SUBMITTED AS AN OBSERVATION ON THIS SUBJECT AND THE OBVIOUS NECESSITY OF THE RATIONAL AND REALITY INVOLVED. BROTHER J. A. GEORGE was our Pastor at First Methodist – Kosciusko, Mississippi where we attended, this back in the years I was growing up; that back in 1940a &’50s and that era before the Methodist-affiliated itself with the liberal, socialist “National Council of Churches and, subsequently, the “World Council of Churches’ and we immediately we severed our all ties with the methodist. Brother George was an elderly tall still fit fellow; a college track star athletic back in his youth; he also a friend and quail hunting companion to Dad and me as well as his being our pastor. He was known for an incident that took place early in this ministry. As a young Pastor, he went to hold a revival in the mountain area of N.E. Tennessee where invariable ‘local drunk toughs’ would do their best to disrupt and close the services. ‘Rowdy’ buddies did exactly that.) This young Pastor, Brother George, was not your ‘run of the mill, milk toast’ young Pastor ,however. When he walked up to the Revival Tent pulpit, he placed his Bible on the middle of its top and on each side of the Bible he placed a pair of revolvers he took from his suit trouser waist band. When the services began, the ‘hooraying’ began, first with the usual shouting outside, the banging on tin, etc. . . . and then, as usual, a knife penetrated near the top of the tent wall at the back of the seated congregation . . . and began slicing down the canvas tent wall. Bro. George. stopped his sermon, and with a revolver in each hand placed two bullets above head height right above where the knife had penetrated. Things were said to have gotten “REAL QUIET ALL OF A SUDDEN” . . . and the noise from outside did not continue . . . whereupon Pastor George continued his sermon that night without further interruption . . . and each of the following nights of that Christian revival that followed, he having SIMPLY PROVIDED A SIMPLY IMMEDIATE EASILY UNDERSTOOD BY ONE AND ALL to those who has so long been disrupting Church Revival Services., that consistent nuisance problem having been tolerated in past revival efforts by previous pastors who simply a persistent failed to be addressed the easily solved disturbance and in many instances simply closed the revivals. adversaries. He simply effectively dealt in the only positive proactive manner, having COMMUNICATED IN AN EASILY UNDERSTOOD MANNER THAT THE PASTORS IN PREVIOUS REVIVALS AND THEIR FAILURE ON THE PART OF PREVIOUS PASTORS TO COMMUNICATE IN A ‘LANGUAGE’ READILY UNDERSTOOD BY ONE AND ALL. Rams of nature and certainly not a nation of SHEEP DOG PROTECTORS!!! Will you address and/or clarify carrying in a church that meets at an elementary school for service (in Colorado)? So in the case of the school you are referring to can I assume it is a public school? If it is a public school then the short answer is that it doesn’t matter if there is a church meeting or any other community function taking place at the school. It is still the school and it’s real property is still covered by the above statute. If the school is private then the above statue isn’t relevant and the school is just like any other private property able to make any restriction it chooses but obligated to communicate those restrictions to patrons of the property. What about Maryland? Can someone with a legal firearm but no CCW carry on church property with the approval of the church leadership? Eli, without a permit having a concealed gun outside of one’s private property is against the law so the question might be, how are you going to get it from your home to the church? Beyond that, the church is private property so with leadership approval I suppose it would be ok, but between your home and the church; without a permit there is no legal way to transport it concealed. What if the Pastor, from Maryland, lives on the property and has permission from the Board? If you live on the property and the laws allows that you can have a concealed firearm on personal property then I would say you wouldn’t need a permit. I do not see the map of blue states and red states attached to the article I am reading. Is Virginia a blue state or red state. Rick, thanks for your comment… I didn’t realize there was something wrong with our map. I fixed the issue and it now is displayed above. Virginia is blue on the map and has no specific church regulation… thus churches act like any other private property in Virginia. My Pastor just asked me to write a legal document concerning concealed carry for children workers (he prefers they do not carry when working with children) and for the general population (protocol when police are on the scene). I have never written a legal document and in dire need of some guidance. Are their templates or examples of legal documentation of concealed carry in a church? AJ, I’ve never written or reviewed just a document but I’m confident that many churches have them in place. You might actually have luck asking the church’s insurance company if they have anything. I know Brotherhood Mutual does a lot in this way of supporting it’s churches. I live in R.I. & my Pastor has asked me to carry & be part of a security team at our church. A couple of guys in a local gun shop told me that with Pastors permission I can carry concealed without a permit, but I can’t seem to find any information “in black & white” & I don’t want to rely solely on someones opinion. Can you direct me to such information? Thanks for that & all the great information here. Brad, my first thought would be… why not get a permit just to be safe? The church is private property so yes I believe that without a permit it is like any other private property in that the owner of that property can make any rules they want if they aren’t in direct violation of any statute or law. That said… how do you intend to get the gun from your home to the church without a permit? I have read the comment from you a couple of times about how a person is going to get their gun from home to the church in this case. I assume you mean how are they legally going to put it on their person during transit without the proper conceal carry permit? Can’t they just have it, in this case, in the trunk like they would when they drive to a shooting range and then once they get on church property take it out and carry it concealed? 1: Churches are private property so unless the state has a statute specific to places of worship; the ability to carry concealed or not legally is probably up to the church/property authority. 3: All that said why not just get a permit? Is there a downside to getting some education and training and not having to worry about the other details? I am a Christian pastor in a small country church in Virginia. We have never had an issue with a threat of violence in the history of the church. But I would like to be prepared in the event of such an incident. I have no problem with anyone in my congregation carrying a concealed weapon and would certainly grant permission for them to do so, but I want to make sure everything is legal (ROMANS 13:1-7). From what I have read, it appears that in Virginia there is no problem in us doing so. But certainly the person must have a permit to do so. Is this correct? Pastor Mike you are correct. In Virginia there is no church specific legal restrictions. Private property is private property and as the acting agent or owner of that property you can make whatever rules you like. Jacob, thank you because many of your articles tend to be more informative using facts instead of radical mindless opinions. I would like to ask you, Do you think is more good that harm allowing civilian access to semiautomatics fire arms? I also like your data graphics, where they are coming from? Jean, Yes I think it does more good than harm allowing civilians access to semi-automatic firearms. To remove semi-automatic firearms from civilians would mean (in the current firearm market) that we basically all have to defend ourselves with bolt action hunting rifles. We mostly make our own graphics internally! In Louisiana I believe there is provision to carry concealed with additional training and permission from the church leadership. We had a security team at our church in LA consisting of LEO’s (both on and off duty) as well as civilians with CHL. The civilians had to take a special training course that was pretty intensive, in addition to their CHL course. The church itself actually sponsored the CHL classes. These additional classes are actually laid out in LA law, but I couldn’t pinpoint it for you at the moment. I read your posting with great interest. It is educational & informative, Thank you. However, the question concerning allowing a parishioner to come onto church property and leave a weapon in the trunk of their car does not seem to be fully addressed/discussed. Do you impose any restrictions on your parish family concerning having a gun in THE TRUNK OF THEIR CAR while on church property or is that still considered an extension of your home and therefore, is not restricted? While doing some research on this subject, I found another interesting idea worth looking into. If you are going to “carry” at your Church functions, have the leadership check into the Insurance carrier’s policies regarding that practice. Similarly, you should evaluate your own Insurance needs as well. Stay safe. security team have a CCW. That would depend on the state. Most states require you have a permit in order to carry concealed but there are exceptions. The recent shootings in TX today 11/5 brought me here. I have a CC permit for VA and am very concerned. Have there been any changes in the law to prohibit carrying in a VA church? I understand one must have ’cause’ to carry which I would qualify for given some previous circumstances. Thank you for answering. There are no changes to what is written above. Your information on Wyoming is wrong. It should be a yellow state – written permission is required prior to concealled carry in any house of worship. See Wy. Stat. Ann. § 6-8-104. Chris, my own home state… and I got it wrong. Thank you for sending the reference. Updating now. (1)(c) A place of worship may authorize its security personnel to carry concealed handguns on its property so long as each member of the security personnel, as authorized, is in compliance with the Concealed Handgun Permit Act and possesses a permit to carry a concealed handgun issued pursuant to the act and written notice is given to the congregation and, if the property is leased, the carrying of concealed handguns on the property does not violate the terms of any real property lease agreement between the place of worship and the lessor. Phil you are correct. Looks like our research team didn’t go deep enough on this. Looks like places of worship are listed as off limits in the statute but then in paragraph C there is an exclusion to the prohibition for authorized security personnel. Thank you for bringing this to our attention! You need to update your reference to scriptures at the beginning (“In Luke, Christ tells his disciples to sell their garments to buy a sword”). This quote is out of context (when I first read it I thought the same as you at first until I researched it). That quote is there but the point of what was said was that Christ said he had to fulfill the prophesies and therefore He and the apostles had to look like a band of brigands. This was just before Jesus was taken in the garden. You will also see the words about 2 swords and his statement “two is enough”. That is obviously not enough for defense but enough to look like an armed band. He also says in there that “he who lives by the sword dies by the sword” – further proof that he meant something other than what you stated. I am a pastor of a small rural church in a town with a population of about 160 people. There are less than 3,000 in our county. I have a concealed carry license. I carry much of the time when I am in the office but not during services. If I were to start carrying during services I would probably want to carry my Ruger American compact in 9mm. The problem is concealed carrying it. I have not found a IWB holster that feels good to me. I have a pastor’s paunch and not a lot in the way of hips. For my S&W Shield I use a Sneaky Pete. At present I use an Alien Gear Cloak Mod holster under a jacket for the American Compact. Sneaky Pete does not make a holster yet for the American Compact. Our church is kept warm enough that during services I preach/teach in shirt sleeves. So an OWB is not acceptable. Do you have any suggestions? I believe I am more accurate with my Ruger American and it has a larger capacity magazine. So it would be my preference although the Shield is better than nothing. To continue the above thought, I am 60 years old and I do not want to carry behind my back. I am not that flexible any more. I am left handed so I would like to carry in the nine o’clock position. Mark, you might consider a belly band style holster or The Brave Response holster. Gary, I believe there is no law for Tennessee churches and concealed carry. They are no different than any other private property. Not sure if this was discussed but what if the church is tied or on the same grounds as a school, for example a catholic school attached to a Chruch I go to Mass? Doesn’t FEDERAL law prohibit guns on any ground where it is used for education purposes. This I know of vague but the law was written that way. Phil there is a short paragraph above about church schools but here is a more specific summary: Federal law dictates that guns are illegal within 1000 feet of a school unless the individual is otherwise permitted by the state. Thus if you have a permit and the state allows that with that permit you CAN be in or at a school then you can. Otherwise you can’t. Also worth noting that some states do have laws that specifically address schools that are in churches. We attend a small Methodist church in a small community in Livingston County, New York. There aren’t any laws that I’m aware of which effectively means you are just a private citizen who may be armed. Mr. Paulsen your article leaves the impression that concealed carry is impossible in a church in Louisiana. That is simply not the case. Law requires permission from the church, and an eight hour class annually. We, and many other churches in Louisiana have met that requirement and are protecting our own at every service. We are no longer a “soft target”. Tony, thank you for calling me out on this. One other person also recently mentioned that option which at the time of writing this article I was unaware of. I will revise the map above shortly. I live in New Jersey and I have a permit to own firearms but off course not for conceal Carrie. Can I conceal Carrie at church with the pastor and the board permition.? They are very concerned about security but we don’t want to do anything illegal. This is bad advice unless NJ law has changed. There is no other exemption for carry without a permit accept for owner of property or business. Richard, you probably know NJ law better than I. Here is what I should say or how I should qualify my statement: There is no NJ law specifically prohibiting firearms in places of worship or churches. Thus in NJ a church is no different than any other private property. So whatever laws govern if you can have a firearm on any private property would also apply to churches in NJ. 1. I attend a church in Maryland where we rent space from a private Christian School. If we receive permission from their Board of Directors, would we(the church) be able to allow those individuals who are legally permitted to conceal carry, do so, with both the church leadership approval and private school’s leadership approval? 2. If this is considered ‘private property’ can individuals with approval, who do not possess CC permits, but have completed the MD police Training Commission firearms safety course have their near…not worn or concealed, for response to an active shooter? Maryland is a “may issue” state for concealed carry. Applicants must demonstrate a “good and substantial reason” to carry a handgun. Permits are normally very difficult (but not impossible) for ordinary citizens to obtain. D. Morris the question about permits is irrelevant. In short, the property is private property. Thus the owner of that property can determine who can carry a gun concealed or otherwise on that property. Since the state has no specific restriction in the law relating to places of worship this church or school or school/church is just like any other private property. Well, I did carry no matter what anyone else thought because I figured I had a good reason before I had the calling, but after I had it I was one of the people who made the trip to a bank to drop the offerings into the night deposit box every Sunday. A member of the clergy would accompany me because there was a rule that everyone go in pairs to ensure no one succumbed to temptation. I had never mentioned carrying to anyone . . . it was after all concealed. But everyone knew me and who I was, and one Sunday as we were making the deposit and I was carefully observing the street while the other person was slipping the envelope into the slot, he turned and asked me if I was carrying a gun. Without hesitation, I answered that I was. The moral? Do what you know in your heart is best and be sure you’re good at it. Period. What if your church has a school only 300 feet away and is a separate building. There’s a 1000feet in law books that prevents hand gun carrier in the church. The Gun Free School Zone act prohibits firearms within 1000 feet of a school unless otherwise permitted by the state. So, if you have a concealed carry permit from your state then the laws in your state that govern firearms in or around schools would apply to the school at your church when the school is in session. It is possible however that any state level restrictions won’t apply to private schools, and its also possible that state level restrictions would only apply to that school on school days or on days when it is in use as a school. Best to consult with a local attorney for clarification. the map I am looking at only shows blue and yellow states. There must be something wrong with my computer that is not allowing the map to show up in all three colors. I am a pastor and our church own’s the property we are on. We are located in Los Angeles County in California where a CCW is almost impossible to get. Is it legal for me to carry concealed if I get permission from our governing body of elders? Would my employment at my place of business? Josh, there no longer are any red states. As of when I first wrote this article there were 2. Now there are zero… so your computer is working just fine! At the church with permission of the property owner you can carry. Without a permit you may need to research how you can locally transport the firearm to and from the church. In Texas, if the church posts 30.06 and 30.07, prohibiting concealed and open carry, can the pastor still designate those with CHL licenses on the security Team to carry? Susan, I believe so. The property owner is effectively placing a restriction and thus can choose to ignore it on a case by case basis as they permit. Hello, thanks for the article. I hope you all had a blessed thanksgiving with friends & family. I live in California and have a CCW. 1. Is it okay to carry at a church? With all of these church shootings I can’t help but want to carry. I love my community and I pray nothing ever happens. I would at least like an opportunity to protect myself if some psycho runs in there firing on people. 2. I understand I can’t carry on school premises. Does this only apply to public schools? What about a church private (non public) school property? Alex, California has no state statute specifically prohibiting concealed carry in a church or place of worship. So, if you have a valid permit, and the specific church doesn’t have any restriction or policy in place then you can carry in that church. Related to schools, the federal law in question doesn’t specific public school. So it broadly applies to all schools. The federal law can only be exempted if “permitted by the state” so unless California law allows that those with concealed carry permits carry into schools of any kind I would say you can’t have a firearm in a school… probably including a church school but it would be best to seek out local legal advice on that one. 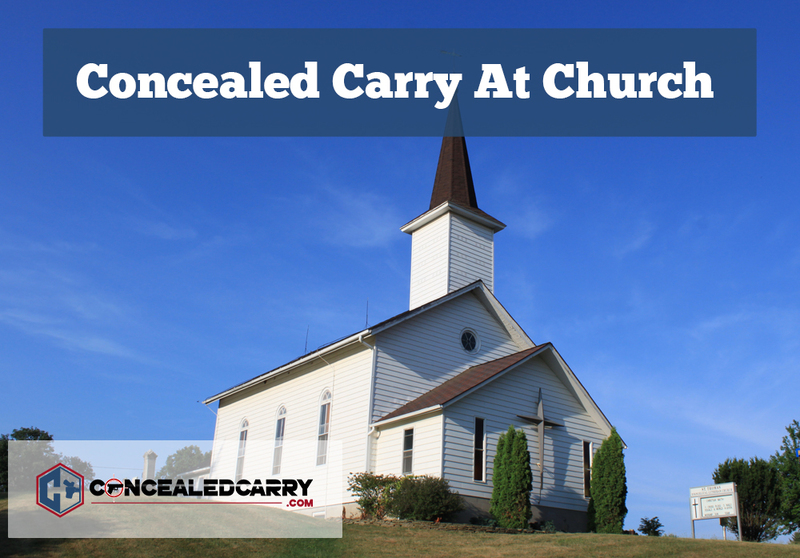 For many churches, the subject of conceal carry in church is a non-topic for discussion! Why? 1. Nobody wants to imagine that their church will be subject to a mass shooting. 2. Many families attending church are anti-gun liberals and would quickly leave the church should published policy openly allow guns in a church. 3. The liability issue for the church of openly encouraging conceal carry and lethal force is unthinkable. With all that stated up front, many churches do not aggressively deny an individual’s right to conceal carry as long as it remains an out of sight secret between the individual and God. Nobody wants to know, especially the clergy and vestry . . . plausible deniability. The subject is never discussed! If and when a conceal carry parishioner needs to defend against a bad-guy, no action is usually taken against the parishioner. The subject is simply ignored until it goes away. Grief Counseling is offered to both the conceal carry parishioner and the other parish members. This is about the best and only passive approach to this subject a church has to offer. Additionally, it is the overall census that any church experiencing blood being shed in their church will permanently “shut the doors” of the church! Nobody wants to worship where people have been killed! I attend a church in Ohio that has a campground as well on the same premises. Per Ohio law, one must have permission from the overseer or pastor to carry in a house of worship. My question is, what about the grounds and other buildings on the same property? I might add that there are NO signage posted anywhere on the property. I am not aware of any case law on that specifically. But I would say you’re not carrying it into the place of worship. Best to retain a local attorney to answer that question! Our church security requests all CCWs that carry in church to identify themselves to the security team, for their own safety. We do not restrict them from carrying but strongly instruct them to follow the same directions at those that don’t carry. The reason: If an active killer starts shooting, anyone with a weapon drawn, is considered a possible killer. It is a known CCW member trying to help. They will distract us from the real killer, when seconds count, and may very put us and others in more danger from the real killer. Our greatest fear is a visitor CCW trying to help. Since we don’t know them, they very likely be looked at as the killer or a 2nd killer. If they point the mussel of their weapon us or another person, it is very likely they could get shot. In these events, shoot/no shoot decisions are made in factions of seconds. PLEASE instruct CCWs if they are visiting a church, to be very cautious about trying to quickly jump up to be the hero. Wait to see if a team responds before responding. If there is a security team, identify themselves to the team before it hits the fan. One last point. Just because don’t see security does not mean they don’t have a team. Most church teams do not wear things that make them targets. In our church, even our general membership, does not know who is on the team. Hey Jacob – GREAT ARTICLE, thank you for sharing! I would add to this, be sure you have solid medical training and NOT one of those online courses and also an IFAK kit. I recommend you consult with a local attorney as local laws and local case law are going to be factors. I am a former law enforcement officer and currently a pastor in Kansas. I am a big believer in the 2nd amendment but I have also had some of the dumbest, most dangerous, unqualified people I know want to carry guns at church and from a legal standpoint they can. I am looking for a way to limit who carries with out having to post a “no firearms” sign. I respect a persons right to carry but I am ultimately legally and spiritually responsible for the people in the church whether regular attendees or visitors and I do want to know who is carrying because if they start shooting I am responsible. Allen, you might consider starting a formal church security team. Set standards for what someone has to do to qualify. Post something that says, “This church is actively protected by trained and organized armed security. If interested in joining the team please inquire within. Otherwise we kindly ask that you leave your firearm at home.” I’m not saying I agree with your decision but this is a potential way that you could approach the situation that might help you serve both your feelings of supporting the right while also restricting guns carried by individuals you feel are not qualified enough to do so. I run the security team for our church in North Carolina. The only thing that is regulated is open carry. The church is posted for no open carry allowed. We have 22 team members and all but one conceal carry when on duty. We are covered by the churches $1,000,000 insurance policy when on duty. We have a large number of Special Forces military in our congregation and they are briefed from the pulpit to keep their weapons holstered in the event something happens and allow the Security Team to engage. The team has regular trips to the range where we run actual shooter drills with scenarios such as we might encounter in church (active shooter alone, shooter flanked by friendlies, etc. ).